Have you ever woken up in the morning to discover your lip is swollen? Maybe it’s your upper lip or your bottom lip, or maybe even just a piece of one of your lips, but it has become noticeably swollen. What happened? You don’t remember getting into a fight, so why is your lip swollen? As it turns out, swollen lips do occur, and there are several causes. We’re going to take a look at what causes random lip swelling, swollen lip treatment, and hopefully, by the end of this, you will know everything you will need to know about random lip swelling. Why Are My Lips Swollen? You’ve woken up, and something feels weird. You go to the bathroom and look into the mirror and realize that your lip is swollen. Why did this happen? Trauma and injury to the lip are often the cause of a swollen lip. Whether it be from being hit in the lip or you’ve accidentally bitten the lip, the lips are a soft tissue area. They can easily be injured, causing swelling as a response. Along with injury, allergic reactions tend to be why lips become swollen. While most lip swelling allergic reactions usually have a connection to food (food has to pass by the lips), it is not limited to food allergies. A viral infection like herpes simplex 1 may cause swelling in part of the lip. Other infections like canker sores can easily lead to a piece of the lip becoming swollen. The swollen lip, especially if it’s only a portion of a swollen lip, can be caused by something as simple as acne. 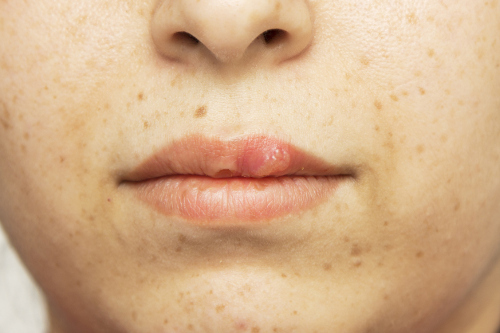 A pimple may be what’s causing your swollen lip. As the lips are soft and sensitive, it’s not uncommon for a sunburn on the lips to create swelling, and in some cases, swelling and blisters. Now that you’ve seen what a few of the different causes of swollen lips are, it’s time to move on to treatment. Luckily, there are more than a few remedies that you can put together at home. With all of the causes of swollen lips, it’s a good thing there are plenty of home remedies that may be able to work for you, and are easy to make in your home. There are even a few remedies that don’t require any ingredients. If at all possible, prevention is one of the best methods to deal with a swollen lip. It’s hard to get a swollen lip if you can prevent the cause from occurring. If you have an allergy that makes your lips swell, avoid that allergen. If it’s sunlight or sunburns that are doing it, look at ways to protect your lips in the sun. Depending on the cause of the swollen lip, a cold compress may be able to reduce the swelling the same way you would use it for any other swelling. Ice wrapped in a cloth placed upon the swelling might be able to do the trick. Interestingly enough, a warm compress might also be able to help with the swelling. A warm compress can help stimulate circulation in the lip and get it back to normal. Aloe vera may work with some the swelling causes since it has antiseptic and anti-inflammatory properties. Take a fresh aloe vera leaf and cut it open. Use the gel from inside and massage it into the swollen area. Repeat this twice a day. Due to its antibacterial properties, natural honey can help heal and reduce swelling to a lip, especially if it’s the result of an infection. Dip a cotton ball into the honey and then rub it on the swollen area. Let it sit for 20 minutes or so before wiping it off. Repeat this treatment two or three times a day. Tea tree oil can help with a swollen lip, but it tends to be some powerful stuff, especially when it comes to smell. However, you can mix a teaspoon of aloe vera gel with a few drops of tea tree oil to get the effects of both on your swollen lip, as well as reduce some of the harsher elements of tea tree oil. A staple of various home remedies, apple cider vinegar can help reduce swelling in the lips due to its ability to help reduce inflammation. Mix one teaspoon of apple cider vinegar with one teaspoon of water and dip a cotton ball into the mixture. Rub the cotton ball on the swollen area. Leave it on for a few minutes before rinsing it off with cold water. Do this twice a day for maximum effect. It might seem a little weird, but yes, baking soda might be able to help reduce the swelling of your lower lip. Add a little water to baking soda to make a paste, and apply it to the swollen area for approximately five minutes. Wash off the paste and repeat this twice a day. This natural treatment should work well with swollen lips caused by blisters, bug bites, and allergic reactions. A black tea bag can help reduce the swelling of a lip in the same way it can be used to reduce swelling around the eyes. Brew a cup of tea with one black tea bag. Steep it for a little while and then remove the bag. Place the tea bag into the fridge to cool further. After some time, take the tea bag out of the fridge and apply it to the swollen area of the lip for several minutes. If you are worried that any of these remedies might make your reaction worse, don’t hesitate to talk to a doctor to ensure that they will not affect any current medical issues. Swollen lips can happen. It might be allergies, or it might be something you did to your lip, like a bite or cut while eating. It may even be a virus causing the swelling. The good news is that there are many treatments available to help reduce the swelling, so you can shrink that huge lip and get on with the rest of your day. Kucherov, V., “Swollen Upper Lip Causes, Symptoms, Sudden and Top Lip Swelling Treatments,” Heal Cure; http://www.healcure.org/lip/swollen-lip/swollen-upper-lip-causes-symptoms-no-reason-sudden-numb-morning-top-lip-treatments/. Kucherov, V., “Swollen Bottom Lip, Causes, For No Reason, Treatment of Lower Lips Swelling,” Heal Cure; http://www.healcure.org/lip/swollen-lip/swollen-bottom-lip-causes-for-no-reason-treatment-of-lower-lips-swelling/. Kucherov, V., “How to Get Rid a Swollen Lip, Heal, Treat and Reduce Lip Swelling,” Heal Cure; http://www.healcure.org/lip/swollen-lip/how-to-get-rid-a-swollen-lip-heal-treat-and-reduce-lip-swelling/. “9 Home Remedies To Get Rid Of A Swollen Lip Fast,” Remedies and Herbs; http://www.remediesandherbs.com/9-home-remedies-to-get-rid-of-a-swollen-lip-fast/. Kukreja, K., “11 Home Remedies to get Rid of Swollen Lips,” StyleCraze, January 9, 2017; http://www.stylecraze.com/articles/home-remedies-to-treat-swollen-lips/#gref.